There is a nice little chestnut orchard on the farm, and luckily it sits just north of my garden. As the seasons roll along I get to watch the trees flower, set fruit, and then watch the green fuzzy balls increase in size. By late August or early September, they will have almost doubled in size and turned a lovely brown color. We'll gather them up carefully, peel off the spiky coat to reveal smooth brown nuts inside. The farmers taught me how to cook them, and we savored them in just about dish we could last fall. 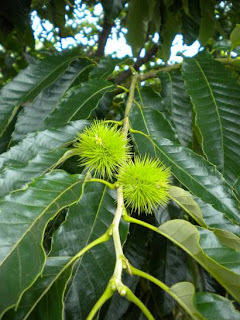 A little different from its taller and more storied cousin, these chestnut trees tend to live only about nine or ten years. Their fruit is just as delicious, although easier to harvest. Right now, I'll simply savor the shade they offer on hot summer afternoons of work.